The Samsung Galaxy K Zoom was the perfect way for us to end the summer, sicne it allowed us to take some pretty shots of the last glimpses of warm nature. The device is also known as the Galaxy S5 Zoom and it’s a 20 megapixel cameraphone, with 10x optical zoom. It was announced back in April, launched in June and you can find it on Amazon for around $450 right now. Its design reminds me more of a camera than a phone and the product is available in black, white or blue. It measures 16.6 mm in thickness, which is double compared to a modern flagship. It weighs 200 grams and relies on a plastic case, that has a dotted/perforated pattern, just like the Samsung Galaxy S5. This model offers good grip, it’s not slippery and sits on the objective when it’s placed on a flat surface. Its lens is covered by Gorilla Glass 2 for safety reasons and this model is not waterproof, in case you want to venture with it into the wild. The format is basically a hybrid between the S4 and the Galaxy S5. The back features the speakers, camera, flashes and once you remove the back plate, there’s a micro SIM card slot under the battery. Upfront there’s the earpiece, sensors, front camera, physical Home button and the two capacitive buttons. We’ve got a microphone and audio jack at the top, while at the bottom there’s a microUSB and microphone. The problem is that this model feels cheap, because of the flimsy plastic case. And now, off to the hardware, that includes a 4.8 inch display, a Super AMOLED with a 1280 x 720 pixel resolution, the hexa core Exynos 5260 processor, composed of a dual core Cortex A15 unit at 1.7 GHz and a quad core Cortex A7 at 1.3 GHz. This model comes with a Mali T624 GPU, 8 GB of storage, 2 GB of RAM and a microSD card slot, that offers up to 64 GB of extra storage. The camera at the back is a 20.7 megapixel unit, with a CMOS sensor, Xenon and LED flash, while the front shooter is a 2 MP one. On the connectivity side, there’s a microSIM card slot, LTE, HSDPA with 42 Mbps download speed, WiFi dual band, WiFi Direct, Bluetooth 4.0, NFC and microUSB 2.0. There’s USB OTG, MHL 1.3, GPS and Glonass. Other specs include an accelerometer, gyroscope, light sensor, proximity sensor and a Li-Ion 2430 mAh battery. Said unit offers 9 hours of WiFi Internet usage on paper, or 11 hours of video or 47 hours of music. In real life testing, we achieved a total of 9 hours and 5 minutes of HD video playback, with WiFi on and brightness at 50%, which is pretty good. The Lumia 1020 for example offers 6 hours and the Xperia Z2 11 hours. The charging takes 2 hours, which is OK. We’ve also got a power saving mode in the mix, one that includes several options, like blocking background data and restriction performance by taking off the vibration, limiting CPU frequency, reducing screen frame rate, turning off the touch key light and the GPS. Then there’s the Ultra Power Save mode, with the promise of about a week of usage, with 70% of battery. Only the essential apps are available in this mode and the connectivity is Off, including WiFi, Bluetooth and mobile. Basically about 30% should give you a day of usage with intense processes. I’d say the battery is good and we move on to audio. There’s the standard Samsung music app here, the same as the one on the Galaxy S5, organized into playlists, tracks, albums, artists, music Square (by mood), and folders, as well as devices. You can set up play speed, music auto off and there’s a Smart Volume feature, that brings all the songs to the same volume. As far as the actual listening experience goes, this model offers a loud and clear song playback, good bass, crisp sound, but the speaker placement is strange (at the back and up). The headphones bundled with the phone are comfy, loud and have a very good bass. There’s no FM radio in the mix and the decibel level is at 84.9 dBA, which is not bad. As far as the video/screen experience is concerned, the 4.8 inch Super AMOLED display is a 720p one, with 306 ppi density and Gorilla Glass 3 protection. The video player offers options like crop, pop up play and has settings for brightness, play speed, Sound Alive and subtitles. We’ve got pinch and zoom in the video window, animated thumbnails in the gallery and no support for DivX or AC3 Audio in files. There’s support for MKV though. The screen offers vibrant colors, vivid ones, deep blacks and a bright and clear experience, plus wide view angles. Contrast is good and so is sunlight behaviour and this display uses Pentile Matrix pixels, with one subpixel. The colors aren’t very realistic and we achieved 400 lux units in our test, which is good and better than the Xperia Z2 and LG G3 for example. The display is good and particularly good for a camera viewfinder. There are also special settings for it, including font, Smart Stay, auto adjust and screen tone. The camera is the equivalent of the one seen on a midrange point and shoot device, with a 1/2.3 inch sensor on board and a 20.7 MP resolution. There’s a wide angle lens in the mix, 10x optical zoom support and aperture going from F/3.1 to F/6.3. The digital zoom goes up to 20x and we’ve got a Xenon and LED flash in the mix as well. Galaxy K Zoom integrates two microphones for audio capture and offers support for optical image stabilization. The F/3.1 aperture is below the cameraphone rivals, since the flagships offer F/2.4 aperture. The camera app doesn’t start up very fast, but at least the focus is fast. Picture taking isn’t the fastest in the world and you can keep the screen pressed to set focus and then exposure using a special square on the screen. The UI is typical for a Samsung device, but with many more options than a Galaxy S unit. On the left we’ve got a custom area, with shortcuts to things like front camera or flash options and then we enter the Settings. Those include Flash, Timer, Detection Display, Tap to Take Pic, picture size (5184 x 3888 in 4:3, 5184 x 3456 in 3:2 or 5184 x 2916 in 16:9), then Effects, Signature, Photo Suggest and Voice Cotrol. There’s video options, like taking a Full HD 60 FPS vid, or a 30 FPS one. There’s also the Multi Motion option, that allows you to create slow mo video at 1/8, 1/4 or 1/2 the speed or fast motion video at double, 4 times or 8 times the speed. The sound section offers options like quiet zoom, normal or mute and we’ve also got Wind Cut and Remote Viewfinder. On the lower left area you’ll find another set of settings, including camera function volume, beep, grid, auto close camera, review pics, location tags, AF lamp, digital zoom and start mode. On the right side of the UI there’s the video and picture shutter, Modes and Gallery. Modes are very varied and they’re a ton, ranging from Auto (auto adjust exposure), to Pro Suggest (that offers special modes combined with Films, that can be downloaded from a Pro Suggest Market). You can create your own Film from combos of settings and options. Then there’s the Mode Program, allowing one to auto set shutter speed and aperture and mess with the rest (ISO up to 3200, white balance, exposure, focus mode and more). We’ve also got Beauty Face, as well as Shot and More, with sub options like Best Photo, Best Face, Eraser, Drama Shot and Panning Shot. There’s Panorama, Virtual Tour, HDR, Night, Continuous Shot and Selfie Alarm (that takes a selfie with the back camera as long as you fit your face into a square on the screen). We continue the huge list of Modes with Manual, that leaves everything up to you, including shutter, aperture, exposure, ISO, white balance, focus and mode. There’s Kids Shot, that plays a cute sound to attract the attention of young ones, Landscape, Dawn, Snow, Macro, Food, Party/Indoor, Action Freeze, Waterfall and Animated Photo, which is a GIF. Sound and Shot, Surround Shot, Silhouette, Sunset and Fireworks and Light Trace round up the list. Galaxy K Zoom offers a shutter speed from 1/1200s to 16 seconds and the Photo Suggest feature mentioned above will tell you cool places to photograph near you. The worst thing about this cameraphone is the fact you only get 8 GB of storage, of which there are actually 4 that are free, so you must have a microSD card. And now we analyze the pictures we’ve taken. The day time gallery was done while taking a tour of the historic monuments of Bucharest and the brightness was great and colors were vivid in these shots. There’s no noise and the level of detail is high. The colors are more realistic than the handset’s rivals can provide and the optical zoom of the camera is kind of slow. I’d say that this model tends to be better than the Lumia 1020 in some aspects, especially considering that the Nokia unit burns sunlight shots of flowers, for example. We played with Pro Suggest options like Vintage Noir or Lemon and had a ball with them. The macro shots include the usual flowers, and a phone case shaped like a melon. Stabilization is very good, especially considering that 90% of these shots were taken on a tour bus in motion. Panorama has stitching problems and the HDR is pretty discrete, but also efficient. We’ve tried Action Freeze on cars and Sound & Shot and we were pleased with these modes. We even tried the camera in low light conditions, at night and it handled everything pretty well, even without flash. It’s certainly above the Galaxy S5 and Note 3, there’s no yellow hue, but the flash is a bit too strong. The Xperia Z2 was actually slightly better at night, as well as the Lumia 1020, that was taken for a spin during a concert. As far as video goes, we tried out slow motion video and that looked satisfying, but I regreted the lack of 4K video capture on this device. There’s good optical image stabilization, very impressive zoom quality and the wind seems to be a bit of a problem, unless you active the required Wind Cut option. There’s no focus loss here and an aspect I didn’t quite like was the fact that when you zoom, the device makes a hissing sound that’s heard on the recording. The video capture happens in MP4 format, with stereo audio capture. The bitrate is 17 Mbps and the audio bitrate is 256 Kbps, while the sampling rate is 48 Khz. The 60 FPS video has a 28 Mbps bitrate and there’s no noise when filming, I’ll give you that much. The Samsung Galaxy S5 has moments when it feels that it’s recording video of a higher quality than this model, to be honest. The Lumia 1020 also has a more impressive video capture. When capturing video at night, the noise level is OK, there’s no yellow hue and no focus loss. There’s no problem with light sources, like on other models and I have to say that the night time filming is not hugely impressive. Overall, this is an excellent midrange camera replacement, but in some area it’s inferior to the Galaxy S5 and Lumia 1020. You still have tons of modes to use, excellent OIS and zoom quality. This is the perfect tool for bloggers, hikers, but not exactly for concerts, since it’s not exactly comfy. For the editing part, we’ve got the Photo Studio app, that offers features like adjustment, rotate, crop and resize. There’s also Tone, with options like brightness, contrast, saturation, red, green, blue, temperature and hue. Effects include tint, stardust, blue and wash, to name just a few. There’s also portrait and options like remove red eye or airbush, plus decorations to apply on pics. Stickers, labels, frames and drawings are also included, plus there’s a Video Studio in the mix. I’d say the Snapdragon 800 bests all, but not by much. Still, the Galaxy K Zoom runs basically any game, but it’s uncomfortable to hold for a long period of time. The OS here is Android 4.4.2, with TouchWiz just like the Galaxy S5. The icons are flat and gloss free, round in the settings area, that can be set up to feature a grid, list or tabs. The widgets area is triggered by holding the recent apps button and we’ve got unique Samsung widgets and transitions here. There’s My Magazine included here, with Flipboard at its core and offered as separate homescreens. It features a News area, Social Area, with the likes of Linkedin, Twitter or Google+ included. The dropdown area offers options like S Finder, allowing you to search for content on devices and find more on the web. There are filters included and a feature called Quick Connect, that lets you see nearby phones and send stuff to them. These are customizable toggles included here. The settings area offers access to a Toolbox, that’s a floating collection of useful shortcuts. We’ve also got an Easy Mode feature, accessibility feats for people with sight or hearing issues and a Blocking Mode, plus Motions and Gestures (direct call, smart alert, palm swipe). We’ve got security and encryption also in the mix and the multitasking looks just like on the Galaxy S5. The list of preinstalled apps includes Flipboard, Maps, Memo, My Files, the Play Suite, S Planner, S Voice, Galaxy Apps, Studio, Vine and Voice Recording. I was actually surprised by how little bloatware there was… for a Samsung. And now let’s draw some conclusions! 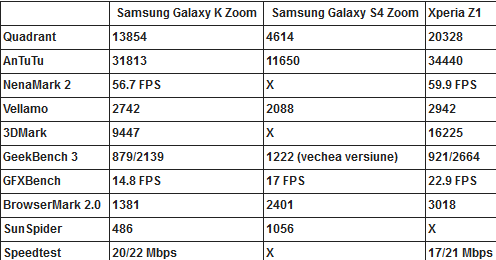 Samsung Galaxy K Zoom gets a 7.5 out of 10 for design, a 9.3 for hardware and a 9 for OS and UI. The final grade is 8.6 out of 10 and this more of a cameraphone for bloggers, hikers, not exactly for professionals and people who want to carry the best mobile camera in their pockets. The only advantage here is that we get better hardware than the Lumia 1020 and a slightly comfier phone.